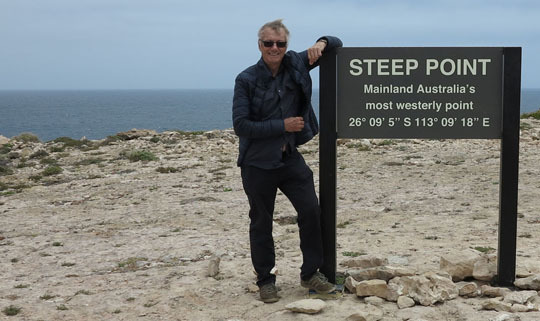 ▲ My recent trek to four Western Australian islands (or island groups) also took me to Steep Point, the most westerly point on the Australian mainland. If you haven’t got a helicopter or a suitable boat you’ll need a four-wheel drive to get there, but that completed my visits to Australia’s four corners. It’s easy to get to Australia’s most easterly point, the place you’d see the first sunrise each day. That’s marked by the lighthouse at Byron Bay in New South Wales and I first went there, riding a motorcycle up the east coast, back in 1974. I was en route to Darwin and then on to Indonesia (via Portuguese Timor) to research the first edition of Lonely Planet’s South-East Asia on a Shoestring. 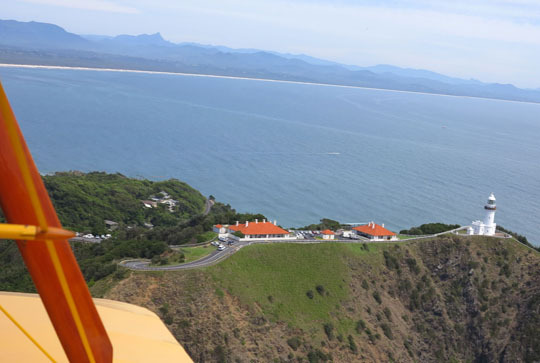 ▲ I’ve been back to Byron Bay many times over the years and in 2016 I not only walked out to the lighthouse I also flew over it in a Tiger Moth biplane. Way back in WW II my father was an RAF pilot instructor and used to fly Tiger Moths and Harvards. ◄ The most southerly point is South Point, at the tip of Wilsons Prom in Victoria. If you want to get there you can drive to the Telegraph Saddle car park in Wilsons Promontory National Park. Then it’s a 13km hike to Roaring Meg campsite and from there an 8km round trip to the point. So 34km total from the car park. You don’t have to walk, however, it’s possible to cycle. 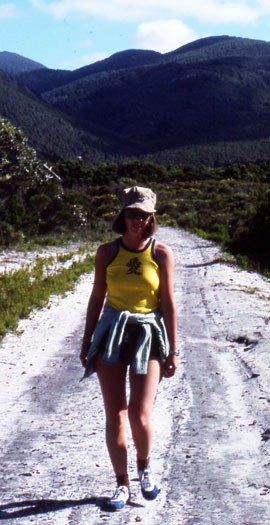 Maureen and I walked down to the point way back in 1977, here she is on the track and from the tyre tracks it would appear a 4WD has been by recently. .
▲ The tip of Cape York in Queensland is the most northerly point, from here you could head north through the Torres Strait Islands to Papua New Guinea, only 150km away. With a sturdy 4WD you can drive the 850km from Cooktown to the cape although there are some challenging rivers to get through en route. I got there back in 1989 by boat, the Queen of the Isles on a trip from Cairns heading up to Thursday Island in Torres Strait. The boat started its career operating from Cornwall to the Scilly Isles off England, then turned up as the Olovaha in Tonga, as the casino boat Gulf Explorer in Australia, reverted to Queen of the Isles II shortly before my trip and then had two more names before running aground in the Solomon Islands ‘around 2001.’ I had a good trip. The USA’s north-south-east-west extremities are complicated because you have to specify whether you’re talking about all 50 states (ie including Hawaii and Alaska) or just the contiguous ‘lower 48.’ Anyway nobody seems very interested. The UK’s two extremities are usually considered to be Land’s End in Cornwall and John o’Groats in Scotland, although in fact one isn’t the furthest point south and the other isn’t the furthest point north. Never mind they do neatly mark one end of the island from the other and cycling or even walking between the two landmarks is popular. According to Google Earth it’s 839 miles by car, a bit shorter on foot, rather longer by bicycle.